There will soon be an all-new 2017 Honda Civic Type R for sale in Montreal! In fact, this summer is the very first time a Type R will be available on the Canadian market, after unveiling a North American premiere on April 12th during the New York Auto Show. Be among the first to test the new Civic Type R - and also the Honda Civic Si - during their arrival at Spinelli Honda in Lachine near downtown, Vaudreuil and Île Perrot! The most powerful and fastest Civic ever created by Honda, the Type R is sure to please performance enthusiasts and fans of sport driving alike. In fact, the 2.0 L 4-cylinder turbocharged engine which will hide under the hood of the 2017 Honda Civic Type R in Montreal produces 306 horsepower at 295 lb-ft. of torque, and it is paired with a 6-speed manual transmission. Also, it has a modified suspension and chassis as well as various components that were created and tested on the legendary Nürburgring racetrack. As you can see, nothing has been left to chance in the design of this model! 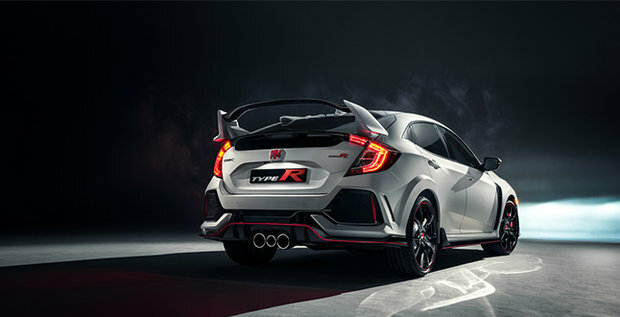 The new Civic Type R near Laval will only come in a single trim, but that will include many standard features, such as sport seats, leather-wrapped steering wheel, titanium gearshift knob, aluminium sport pedals, a 7-inch touchscreen, navigation system, Apple CarPlay and Google Android Auto compatibility as well as a 542 W 12-speaker sound system, to name but a few. At Spinelli Honda, we also have many used Civic at the best prices in the region. Take advantage of our many current Honda promotions as well as our various and advantageous Honda financing rates, and that's whether you go for a used model or for one of our available 2017 Honda Civic Type R. Come see us today! We are easily accessible from Île Perrot and Vaudreuil!